Are you in need of a cemetery memorial in Elyria, OH? 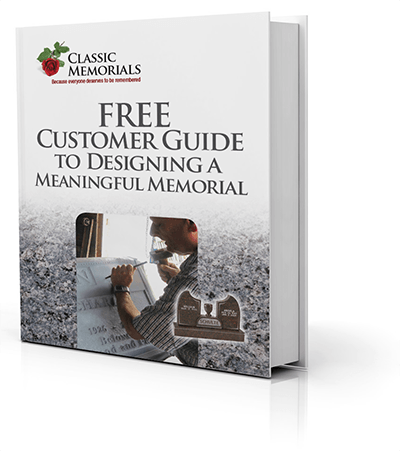 If you’re looking for a unique monument or headstone to mark the passing of your loved one, Classic Memorials is the premier cemetery memorial company. We create lasting memorials that honor the dearly departed. With four generations of experience in the memorial business, we create quality monuments and headstones at a reasonable cost. Trust our record of satisfied customers in the Northeast Ohio area and our success in helping families and friends commemorate those who have passed away. Our president and MBNA’s Certified Memorialist®, Val Konstantinovsky, takes special care when creating a memorial by working with families and analyzing portraits of the departed. For the finest quality engraving, Classic Memorials is your best choice. We can provide you with any shape of memorial and headstone while using high quality granite to ensure your loved one’s memorial lasts forever. We use state-of-the-art design programs so that you can approve pieces before their creation and work with our memorialist team to make any adjustments. While our pieces are made with quality in mind, our payment plan options can help as you wait for estates to be released or for other financial means to be available. We work hard to make sure the deceased’s memorial is one that families and friends will be proud to pay their respects at. With a population of 54,533 residents, Elyria pairs small town charm with new development and restoration. The city is situated by the Black River and was originally founded because of its proximity to the river. As a bedroom community to Cleveland, Elyria sees new homes and roads annually. We appreciate the opportunity to work with the residents of Elyria. While residents can enjoy the many amenities of Cleveland, Elyria provides plenty of its own. A favorite park is Cascade Park that showcases the Black River and waterfalls. Several public departments also cater to Elyria like their own school system, public works, and parks and recreation. The town’s downtown has also experienced revitalization efforts that have updated infrastructure and brought in new businesses. Helping Elyria residents remember their loved ones is an honor for Classic Memorials. Memorialize your loved one with a monument or headstone as beautiful as they were. Trust Classic Memorials with all your cemetery memorial needs. Contact us at 216-321-6740 or 800-278-8523 to start working on a monument or headstone today.